Range hoods are a priority during outfitting every place requiring impeccable work of ventilation system equipment. Moreover, it is worth mentioning that, aside from basic ventilation function, they serve to purify air from cooking smells and vapour (i.e. washing machines, ovens), remove hot air generated by different kitchen equipment and, additionally, can have the fresh air supply option. 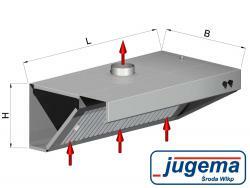 We manufacture both wall and central versions, as well as whole ventilation ceilings. 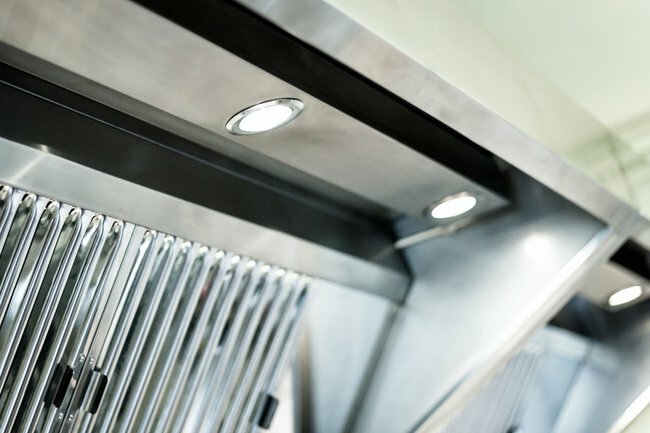 More than 30 years of experience allows us to offer you not only a wide range of ventilation hoods, but also to provide technical help in choosing right product. We are aware that convenient conditions prevailing in kitchens underline its proper working and contentment of the people staying there. Furthermore, we are sensible of the shortest possible order time which is very important to our clients. Thus, we do all we can to fulfil each order you place with dispatch and to issue all products from our plant with the highest quality possible. You are welcome to familiarise yourself with the wide range of the products in our online shop www.sklep.jugema.com.pl. 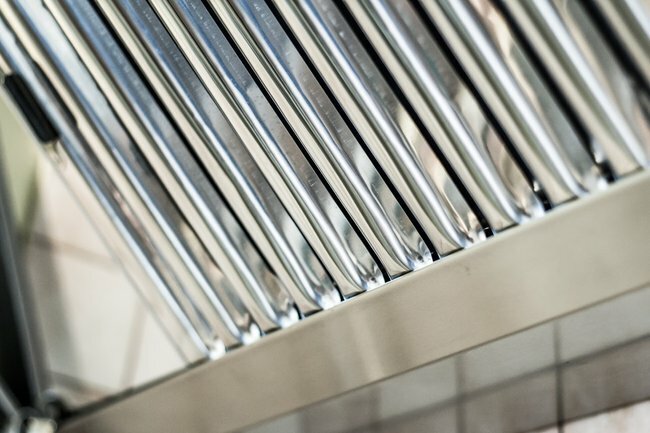 By the air flow direction presented in the picture, this type of extractor is used to remove the dirty air out from the kitchen, usually grease molecules. 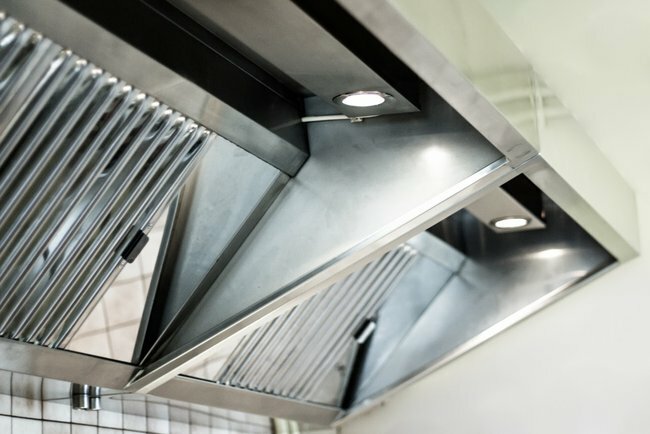 Due to grease catchers inside the extractor hood , particles are picked up from the air and streamed to the drain troughs. A plughole fitted in all the versions allows to remove the impurities in an easy way. Arrows direction shows the flow of air molecules. Red colour is extracted stale air, while blue colour represents fresh, purified air supplied to the room. 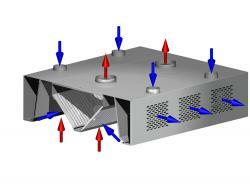 The purpose of such circulation is to create and maintain the best conditions possible for people in ventilated space. Due to this technology the hood is even more effective than an extraction hood as a result of supplied fresh air which cools down the surface of the filters, thus, reducing the amount of extracted impurities. 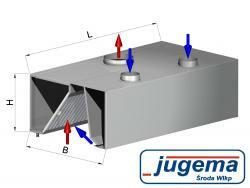 Moreover, there is no need to install ventilation gratings. 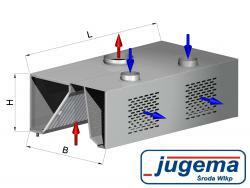 In the second type of Jugema recirculation hoods orientation of fresh supplied air which comes out from the appliance by the perforated front wall stands out. Such technology allows fresh air molecules to get into the room without direct contact with stale extracted air. Thus, the molecules are not combined. Exact air masses wandering is shown in the picture. 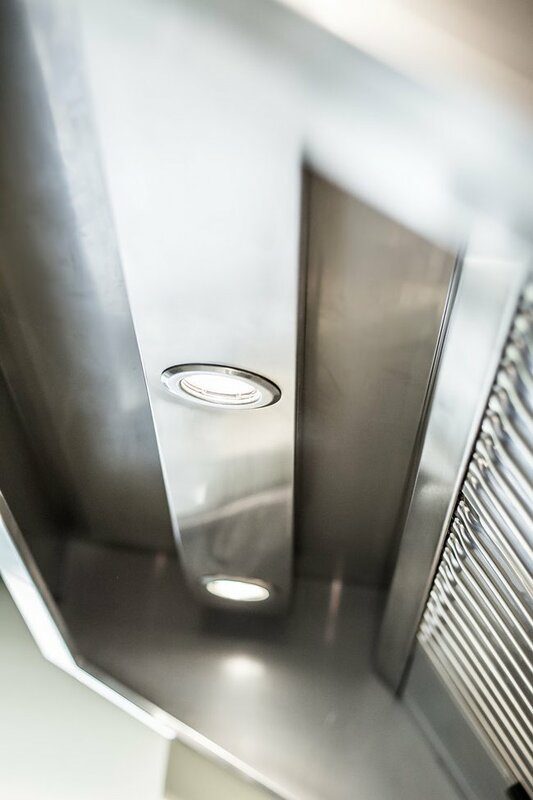 The most complex extractor hood in terms of functions. It has both the air supply and the air extraction functions. Due to the combination of compensation and induction friendly working conditions for the people being in the room are obtained. Moreover, there is no chance that kitchen odours enter other rooms through ventilation. The following technology is shown in the picture.